I am a little late in posting this one, in fact I’ll be able to put up the January mailbag here pretty soon as well. Here are the mailbag responses from November. I’ll will provide as concise answers as possible. Question One – From Utah – …..Against a 4-4 with two 2is two tight 5s and the inside LBs lined up in B gap and coming hard DEs would force the give. We had a hard time getting down to LBs with our tackles and only . We were at 4 &1/2 foot splits and other than shortening them up what else could we do to get triple more effective? 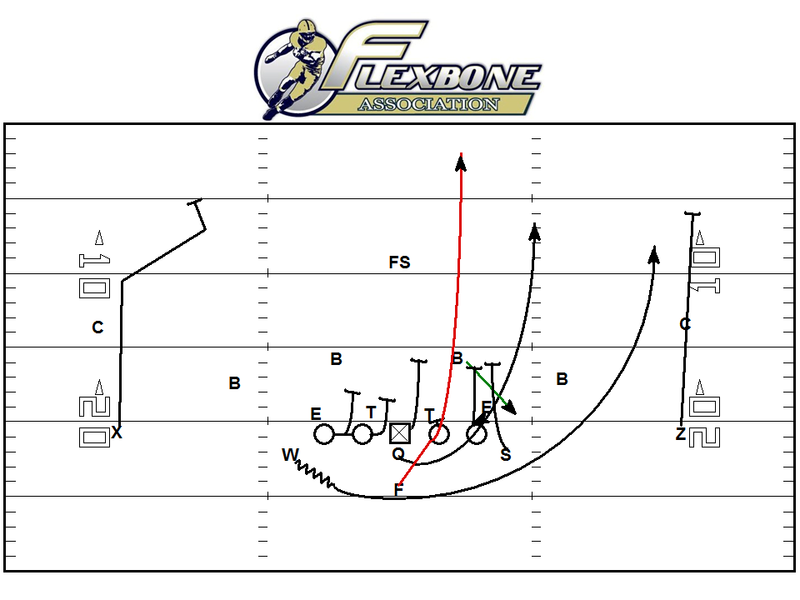 If you are facing a 4-4 defense with #3 in the middle of the field, in this case the free safety, the Option Count rules (which is Module 3 in the Flexbone Association Academy) state that you must run the Load tag against this look. What this allows you to do is call the Playside Linebacker In. The Playside A-Back will load the Playside Linebacker to level three, meaning he will look to block the PSLB first before continuing to the free safety. Your offense can now account for the PSLB regardless if you get a squeeze and scrape situation or not. 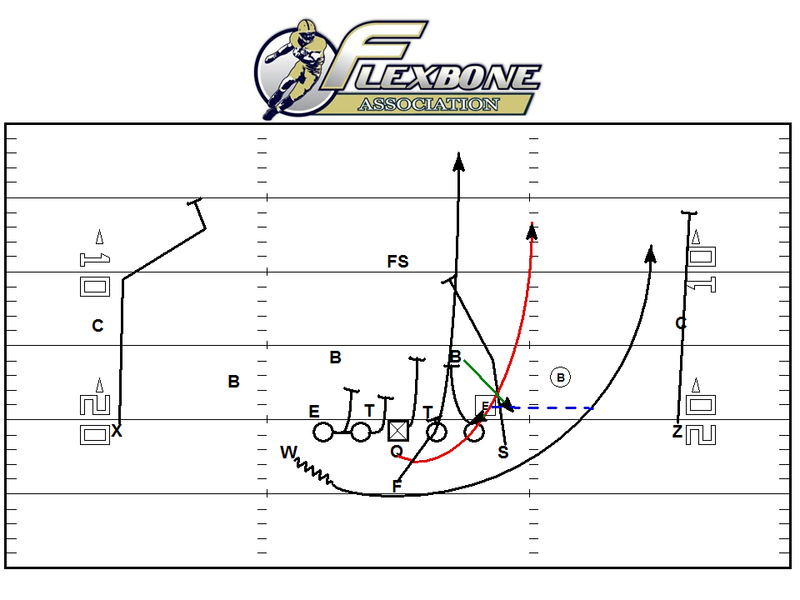 The appropriate answer to a squeeze and scrape scheme from the defense is to run Zone Dive. This play has been incorporated in the offense to handle this specific situation. Question Two – From New Jersey -……What do you do pre-snap to insure everyone is on the same page when running triple. Do you call out the front, do the slots signal the split ends? Do you do it on every snap? We use an Option Count system. I just finished the video yesterday for the Flexbone Association Academy that explains in detail what your count will be against every conceivable standard front you might see throughout the course of the year. The Video is Module 3 of the Academy, and is 45 minutes long. It includes count descriptions against (4-4, 6-2, 4-3, 6-1, 3-4, 5-2, 5-2 and 5-3 Double Eagle, 3-3 and 5-3). In simplest terms possible #1 is the first defender from a 4I out. #2 is the next defender outside of him either on or off the line of scrimmage. #3 is the run support defender. We make sure everyone is on the same page, including the linemen and all skill position players. We do use a series of hand signals and calls if the perimeter players need to communicate with each other. We make these calls/signals on every play regardless of what play we are running. 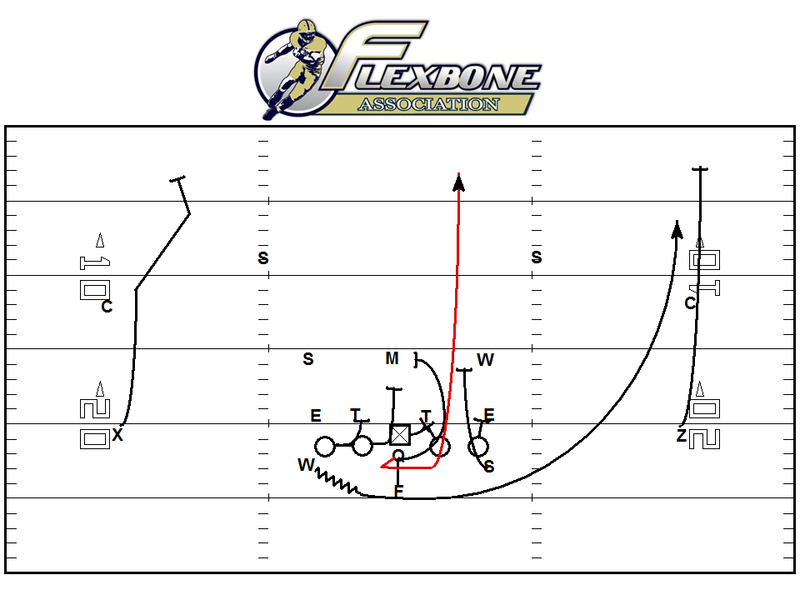 Question Three – From Nebraska -…….What is your answer if you have Midline called and they have an A-Gap player or a 1-technique? We don’t like running Midline to A-Gap players. If you do not check plays at the line of scrimmage (we do and I suggest you do), then you really only have one option. I haven’t seen Navy do this much, but if I remember correctly they ran it quite a bit against Missouri in the Texas Bowl in 2009. Your only option is to have the Playside A-Back insert (Midline White) and wrap the B-Back around the 1-tech to block the Mike or Inside Linebacker. Your Playside Guard and Center can Ace the A-Gap player. It would be an automatic pull for the Quarterback. The diagram below shows this play against a 4-3. Question Four – From California -…….What do you teach your Quarterbacks on the mesh? This is one of my favorite topics. In fact I was doing impromptu demonstrations this weekend on Robert Ingram’s (Riverwood, GA) deck at about 2:00 AM. I went to the Nike Clinic in Atlanta this weekend. Here is an article I wrote in the past covering this subject. Give it a look, see if you don’t agree. Question Five – From Ohio -……What do you do to make sure your team is ready to play against different fronts. Alot of times we get teams that run something different on Friday than they ever have on film. Here is an article I wrote previously about practice, and another about game planning. We also make sure we run the 3 on 3 drill and Option Drill every Monday and Tuesday for sure. These two drills give us a multitude of reps for both the linemen and the skill kids against every front we could possibly see on game day. How can the Flexbone Association help you with your goals in 2014 and beyond? Is the Academy right for you? Possibly an Academy and a Camp? Over 100 schools have received assistance from the Flexbone Association over the years. Send me a message if you have questions. At some point this fall you are going to be faced with a 4th and goal situation. Will your team be fully prepared? Don’t ask yourself “What-If” come September!